I am always sad when Christmas is over, but excited to begin the year anew, with new goals, new experiences, and new things to look forward to with the ones I love. 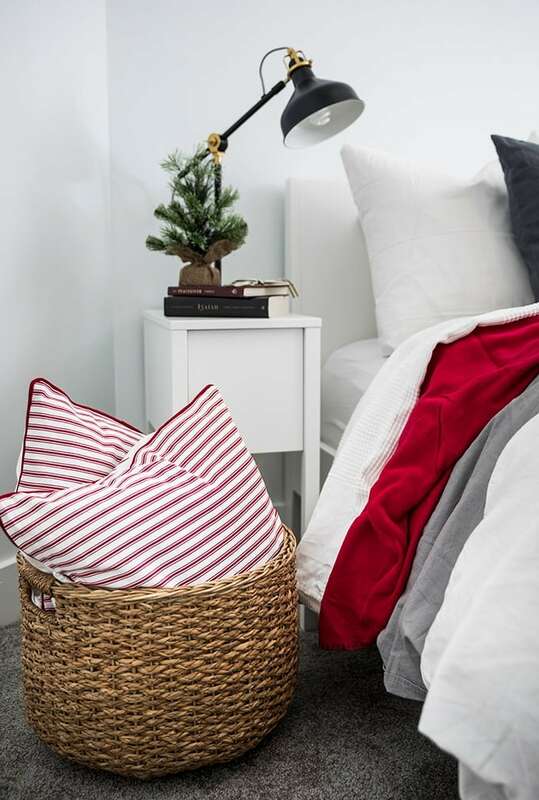 In January, I always crave organization and a fresh, clean and decluttered home. 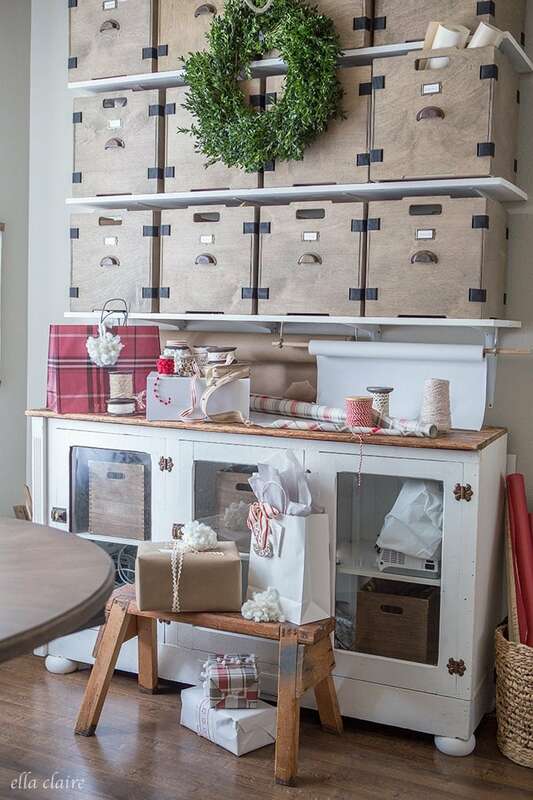 I thought I would take a little time today and chat about one of my favorite organization and storage solution- open shelving- as we all gear up to get our homes organized during this new year! You can see some other great Organization solutions for the New Year with Julie Blanner and 8 total bloggers over on her site today. I will also link to everyone at the end of this post. There are so many great ideas that I think you will love. We live in a home that lacks storage space, so we have had to be creative to accommodate our family’s needs. 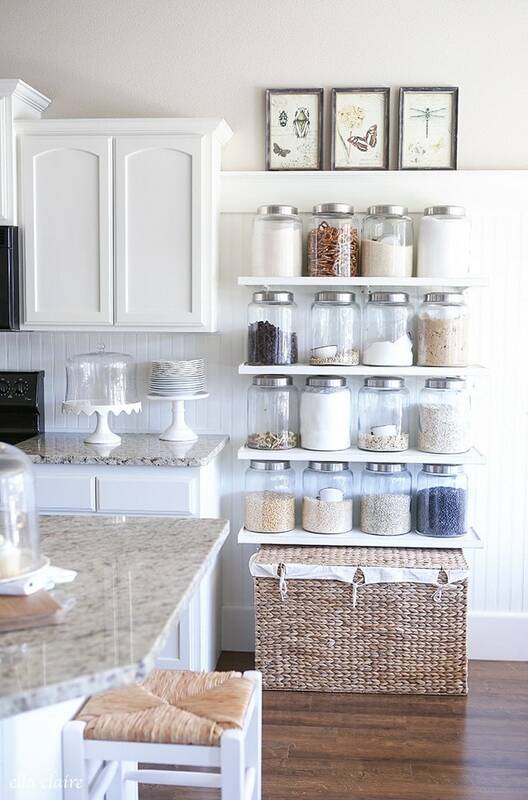 I have found that the best way for us to add storage is to do so in plain sight with beautifully organized open shelving. It seems that most people use open shelving for decoration in a room, but in our home every shelf serves a purpose. I use baskets, jars, bins etc. 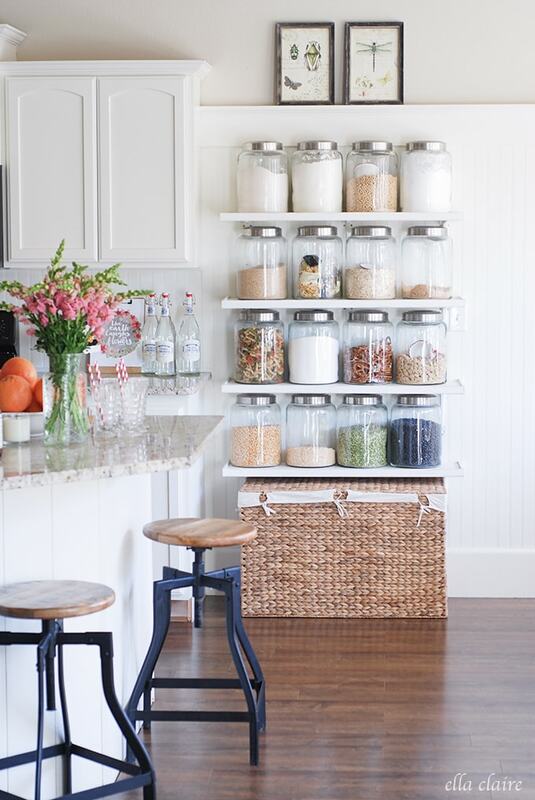 to organize our everyday items in a way that is both pretty and functional. As a bonus, I tend to keep things more organized if they are pretty, so it is a little extra motivation for me as well. We are actually in the middle of building open shelves for toy storage right now as well as planning some open shelving for our Laundry room, so stay tuned! One of the biggest storage issues in our home with our family of 5 was our teeny- tiny pantry. The door is about half the size of a regular door- so very tiny. We needed more space so I dreamed up this little solution for our bulk/staple items and my sweet hubby built it for me. You can see the tutorial and details HERE. This has been, by far, the best thing we have done to our home. We use this multiple times every day and I can’t imagine not having it now. One of the most common things I get asked about is how I am able to have these jars with 3 littles under the age of 5. If you see the tutorial, you can see that it is actually impossible to knock the jars off of the shelves because of the built-in lip. I have also been diligent about teaching them not to touch the jars and even my rambunctious boy doesn’t mess with them. I use the basket under the shelves to store all of the items they generally use at the counter- play doh, markers, crayons, paints, etc. We don’t have a linen closet in our master bathroom so my husband and I built these shelves to create a sort of open linen closet above our tub. 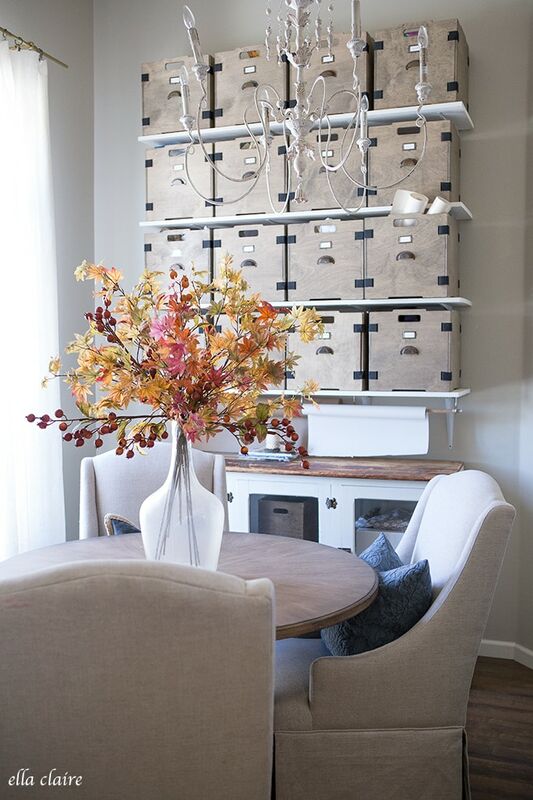 It is so nice to have the extra storage as well as a pretty and functional focal point in the room. I used a combination of baskets and jars to give us all of the holders we needed for our everyday items. The kids bathe in our big tub most nights, so, underneath the towel rolls there are bath toys and bubbles for them as well. I am a stay at home mom, but I do earn my income through blogging and my online shop. 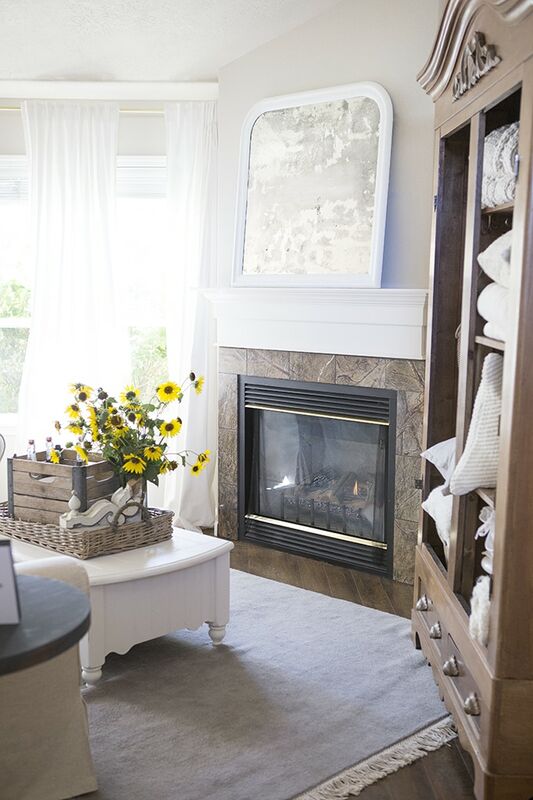 I also love to entertain and create, so I needed a space with ample storage. This office space of ours was pretty and felt big and open with its tall ceilings (14 feet), but really lacked in function because it didn’t have any kind of closet or storage area. I designed this little storage system (you can see the full DIY details HERE) and it has been so functional for my business and our family. If you hadn’t noticed with my kitchen shelves, I love repetition and order. I love the repetition of the large boxes in this space. When looking at installing shelves in any large space where there are a lot of other things going on, I think that simple is best. A bunch of different knick knacks and various items on these shelves could look like a hot mess, but the repetition of this classic box with labels makes it look like much more of a built-in design feature- much like a vintage apothecary. The chandelier is much more substantial in person, so it really balances out the massiveness of my storage wall. 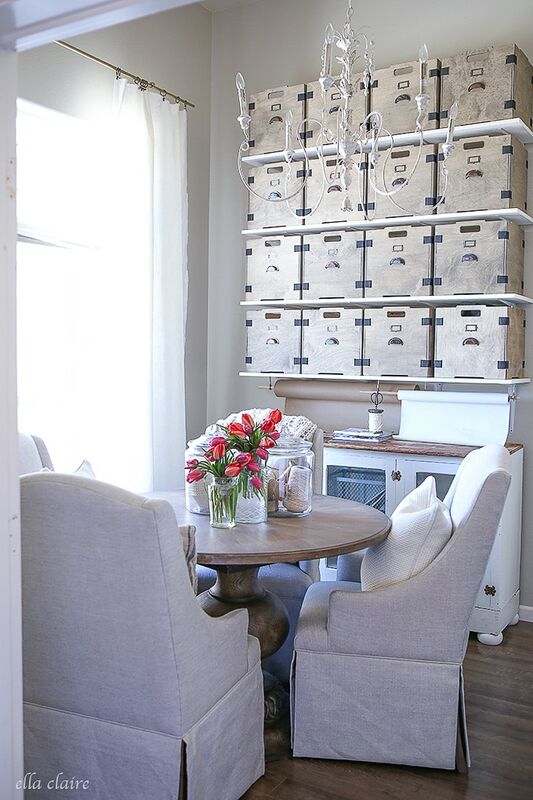 I also love the nod to industrial farmhouse design in this very well-used space. 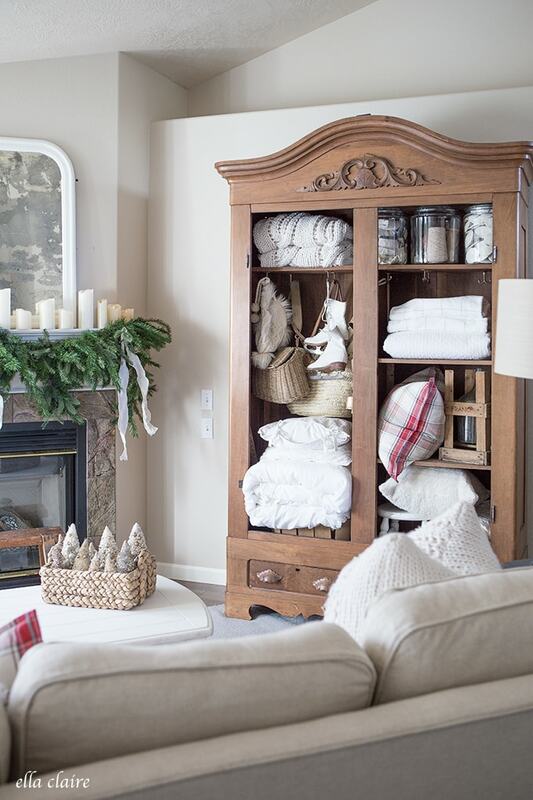 I took the doors off of this large, 8 foot Antique European Armoire (Craigslist score) to create a cozy open shelving feel in our Family room with extra linen and toy storage. I wasn’t in love with the doors on this cabinet originally and really liked the way it looked opened up. This would also be a great option if you are renting and cannot drill shelves into your wall, but still want to create the functional and styled feel of open shelving. The basket and drawers hold toys (mostly my boys’ toy cars that they love to play with on this floor) and the shelves hold blankets and quilts to free up our tiny linen closet for other things. I have an additional armoire upstairs for linens as well. 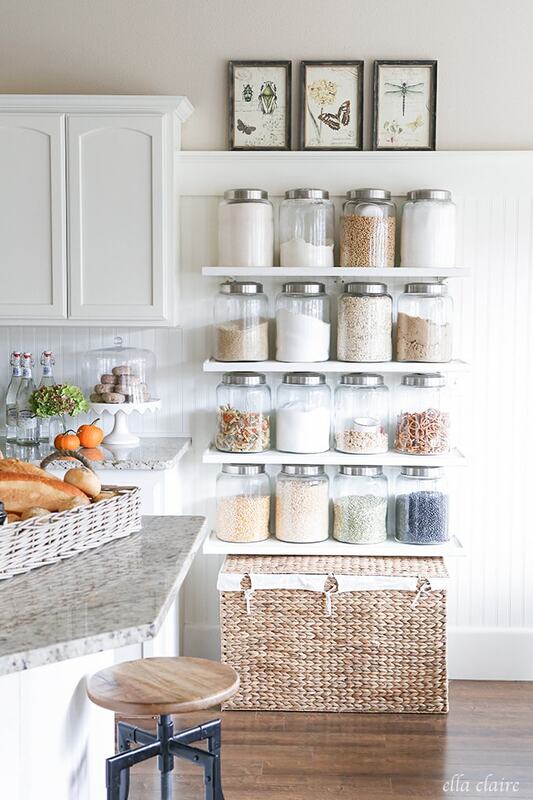 I really love the style and functionality of orderly open shelving. We are in the middle of a playroom/ bonus room overhaul where we are including open shelving for toy storage and I can’t wait to share that with you in the next couple of weeks. I am also in the planning phase of adding some to our Laundry room, so if you have any great tips, I would love to hear them! There are many more great organizing ideas and tips on these blogs today, so I hope you get an opportunity to check them out! 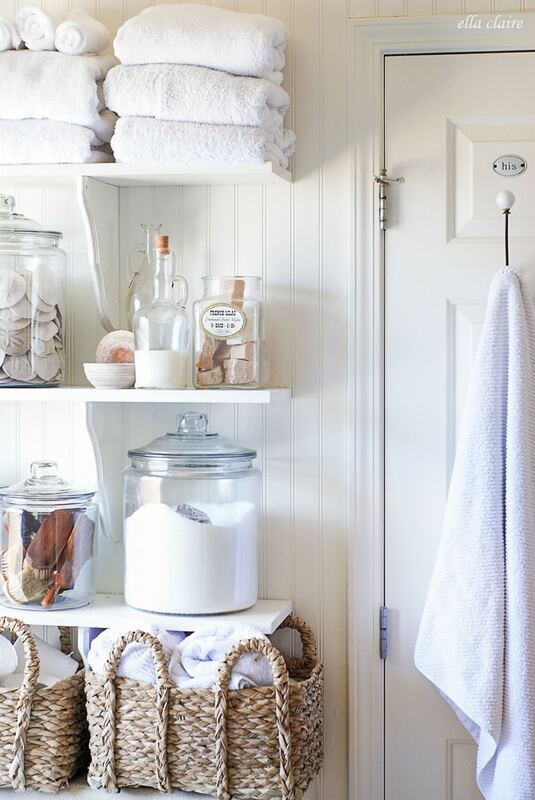 I’ve always admired your kitchen shelves, but your bathroom shelves have my whole heart! You are the queen of open shelving! 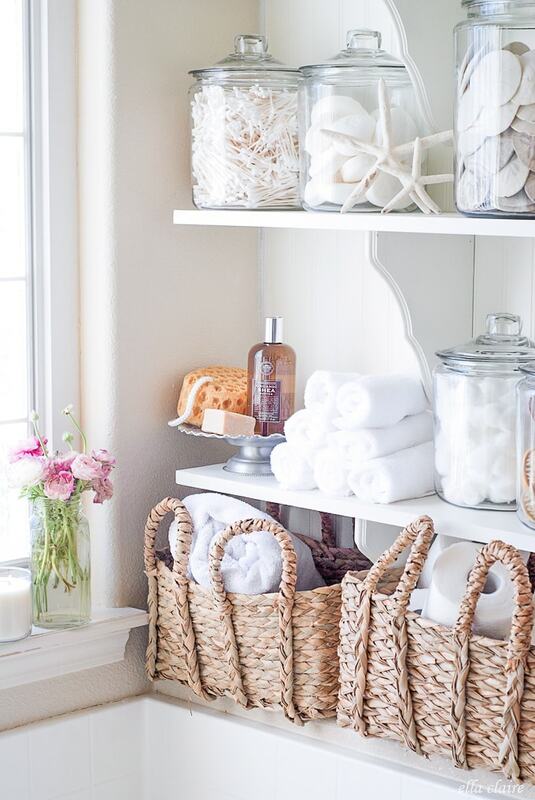 I always refer back to your bathroom shelves when I need open shelf styling inspiration!